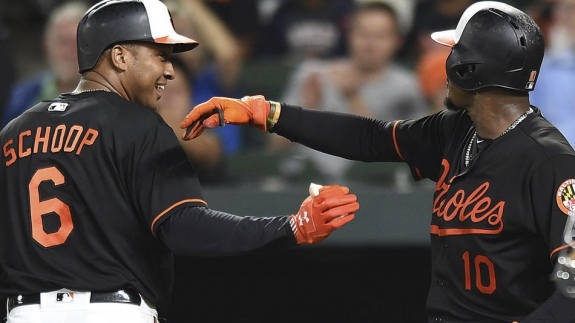 Baltimore's Adam Jones congratulates Jonathan Schoop following his fifth-inning home run against the Tampa Bay Rays on Friday night. Earlier this season, the rebuilding Chicago White Sox were on a mathematical pace to supplant the 1962 New York Mets as the worst Major League Baseball team in the modern era (since 1900). Since then, the White Sox have played better -- by no means pennant-winning baseball -- but more indicative of a team with competitive aspirations for future seasons. After suffering a 10-5 loss to the Toronto Blue Jays last night, the White Sox have a 36-67 record. That's good for a .350 winning percentage. That still means the White Sox are on pace for a 105-loss season. While not good, that falls well short of Casey Stengel's 1962 Mets. 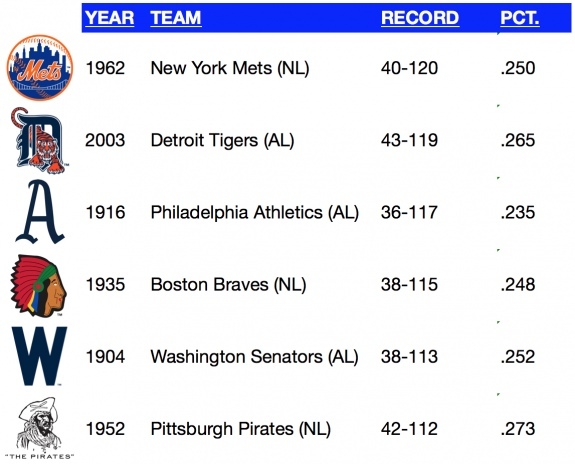 Barring significant injuries and atrocious play, the White Sox won't finish among the six worst teams of all time. But there's the 2018 Baltimore Orioles. Following games on Friday, the Orioles are 30-74 (.288). They clobbered the Tampa Bay Rays, 15-5, but they remain locked in the American League East cellar. The Orioles are 41 1/2 games out of first place in the division and 31 1/2 games out of the wild card race. With elimination numbers of 17 and 28 in the division and wild card respectively, Baltimore's season is over. With a .288 winning percentage, the Orioles are on pace to end the season with 115 losses. That's not enough to topple the 1962 Mets, but it certainly places them in the team photo. With 58 regular season games remaining, Baltimore will need to compile an 11-47 (or worse) record to pass the Mets' mark for futility. That equates to a .190 winning percentage down the stretch. That seems unlikely, but the Orioles did trade their prized asset during the All-Star Game break when they shipped shortstop Manny Machado to the Los Angeles Dodgers. Of course, they still have 23 games against the Boston Red Sox (7), New York Yankees (9) Cleveland Indians (3) and Houston Astros (4). The Red Sox (72-33, .686), Indians (56-46, .549) and Astros (67-38, .638) all lead their respective divisions and the Yankees (65-36, .644) hold the top AL wild card slot. Despite how bad the season plays out, the 2018 Orioles will probably not catch the 1899 Cleveland Spiders: 20-134 (.130).